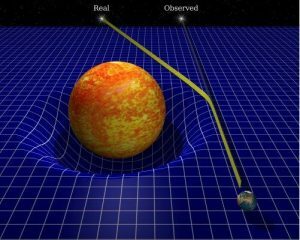 Gravity governs the structure and evolution of the entire Universe, and it is successfully described by Einstein’s Theory of General Relativity. General relativity (GR), also known as the General Theory of Relativity, is the geometric theory of gravity published by Albert Einstein in 1915. GR generalizes Einstein’s special relativity and Newton’s law of universal gravitation, providing a unified description of gravity as a geometric property of space and time (or spacetime). In particular, the curvature of spacetime is directly related to the mass, momentum, and energy of the matter and/or radiation, according to the Einstein field equations. Despite being over 100 years old, GR represents the current description of gravitation in modern physics. In fact, the predictions of GR have been extremely well tested in the “local” universe, both in the weak field limit (as in the Solar System) and more recently for strongly self-gravitating bodies in pulsar binary systems. The first test of GR was the Eddington’s solar eclipse expedition of 1919 by Eddington, and remarkably GR has successfully passed all tests carried out so far. Nevertheless, gravity in its GR description remains the least understood of all forces, e.g., resisting unification with quantum physics. In fact, GR assumes a classical description of matter that completely fails at the subatomic scales which govern the early Universe. Therefore, despite the fact that GR represents the most successful theory of gravity to date, it is expected to break down at the smallest scales. So, does GR hold in its most extreme limit? Or are alternative theories of gravity required to describe the observable Universe? These questions are at the heart of our understanding of modern physics, that BlackHoleCam wants to address. The largest deviations from GR are expected in the strongest gravitational fields around black holes (BHs), where different theories of gravity make significantly different predictions. The recent detection of gravitational waves by LIGO seems to indicate that even events associated with very strong gravitational fields, such as the merger of two stellar-mass BHs, fulfill the predictions of GR. This extremely exciting discovery calls for additional verification using observations in the electromagnetic spectrum. In fact, astronomical observations and gravitational wave detectors may soon provide us with the opportunity to study BHs in detail, and to probe GR in the strong-field regime, where tests are currently lacking. The most fundamental prediction of GR is the existence of black holes (BH). 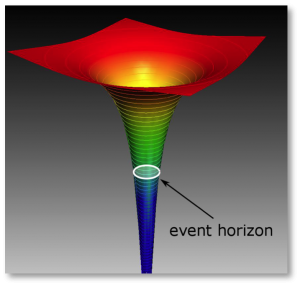 The defining property of a BH is the event horizon, a “one-way” membrane in the fabric of spacetime that defines the boundary between regions (inside and outside the BH) that are causally disconnected. At this boundary, the gravitational pull becomes so large that nothing can escape, including light (that is why BHs are black!). For these reasons, the event horizon has been defined as “the shell of points of no return”. Are BHs just a mathematical concept, or are they real, observable astrophysical objects? Among astronomers, their existence is widely accepted, and there are many convincing BH candidates in the Universe. In particular, they come in two fundamental mass classes. Stellar-mass BHs have masses of order of 10 solar masses, and sizes of tens of kilometers. There could be up to 100 millions stellar BHs in our Galaxy. Supermassive black holes are millions to billions times larger, and are detected in galaxies at distances from Mpc to Gpc. Interestingly, BHs are completely ”black” only within the event horizon, but outside, light can escape. In fact the surrounding matter accreting onto the hole heats up through viscous dissipation and converts gravitational energy into radiation. So what would a BH actually look like, if one could observe it? This the question that BlackHoleCam is going to answer.